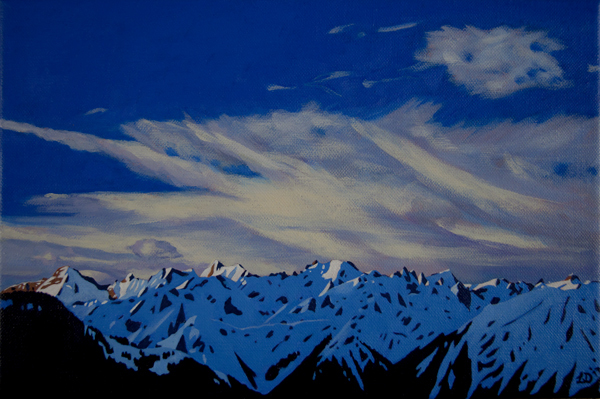 All of these paintings were inspired by my time living in Verbier, in the beautiful Swiss Alps. Mountains painted here include the Grand Combin, Petit Combin, Les Dents du Midi, Mont Blanc and Mont Rogneux. The Panorama paintings of the view from the top of Mont Fort stretch all the way from Dent Blanche and the Matterhorn in the distance on the left, to the Combins and the Mont Blanc Massif on the right and take in the Lac de Mauvoisin and Lac de Louvie.